Today is my birthday! Woohoo! It’s been a great day too. My hubby surprised me with a music album of 40 songs by the very talented (and entertaining) Betty Hutton and later on, we are headed to my mother’s house for cupcakes and Oreo cheesecake! Yay! I’ve been busy with several projects lately and my nails and blog have been on the back burner. I made sure to do my nails for a special occasion like my birthday and I’ve used a new polish sent to me by Girlstuff. 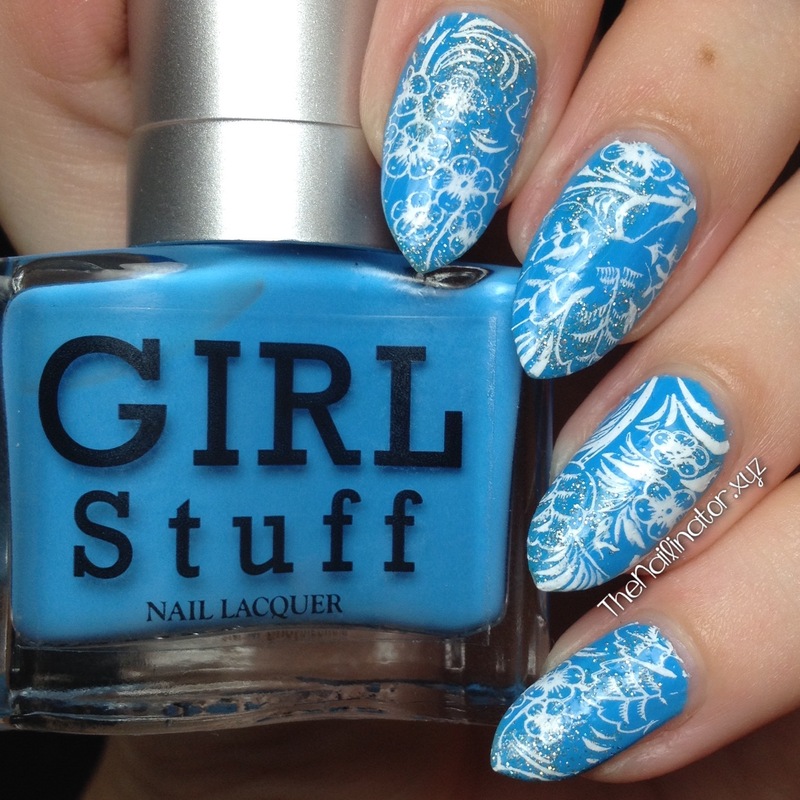 They have recently launched their new Rave Neon collection and I chose Girlstuff Chill which is a fun blue shade. It is opaque in two easy coats and dries quickly. 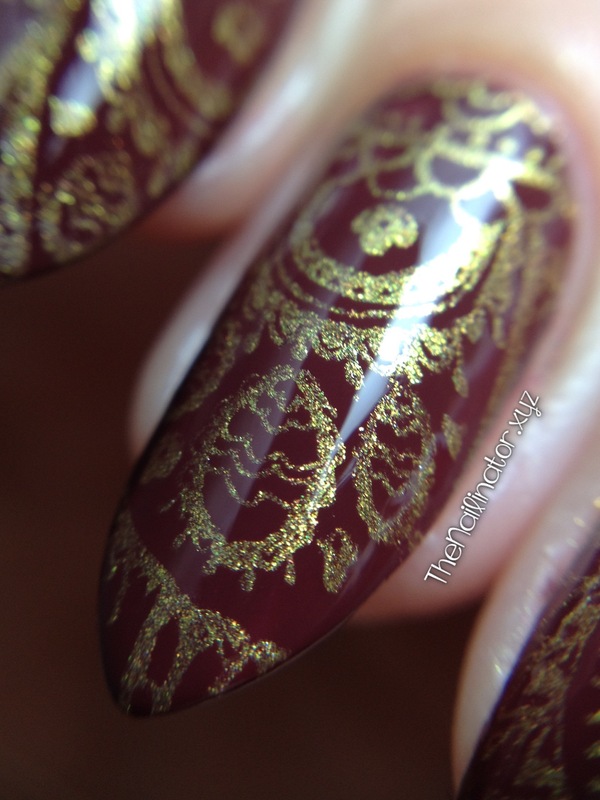 I brushed a little glitter here and there and then stamped over it with my MJ XXVI stamping plate from MyOnline Shop. It’s simple but pretty. I’ve been wearing polish pretty consistently but haven’t taken the time to do any nail art. 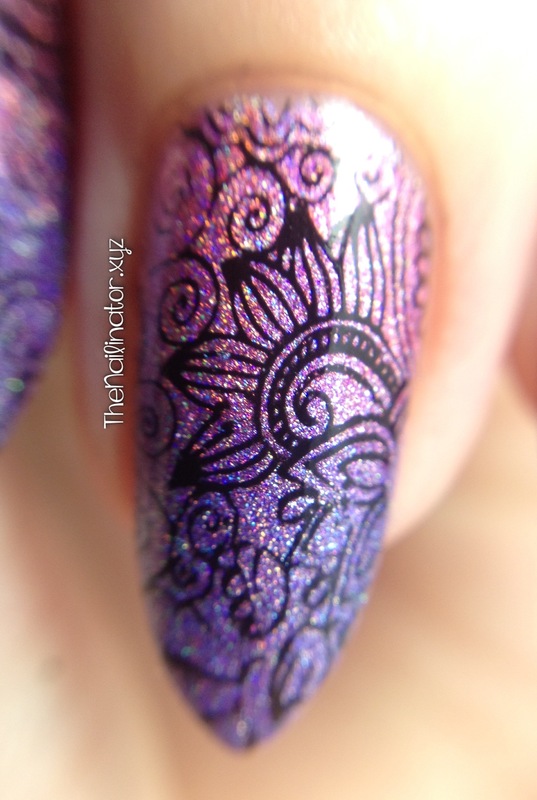 So I’m very happy to have a pretty design on my nails. Today. I hope your day is as lovely as mine has been. Do something to make someone smile today! I noticed that I have had a harder time keeping up with the blogging these past few months. I’ve got a good reason though. For the past three months we’ve had some visitors, I’ve been helping hubby with a huge renovation project, keeping up with school with the kids and had a few health issues to deal with. The good news is that the renovation is almost complete and I’m looking forward to things getting back to normal. I’ve still been doing my nails so I’ve got some fun looks lined up to share with you. 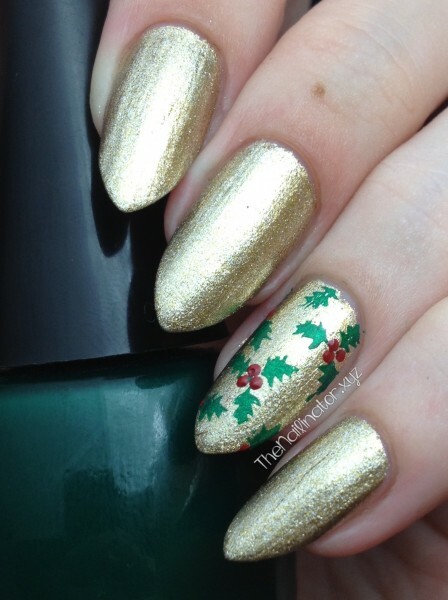 I am so excited to get to some Christmas nail art very soon! 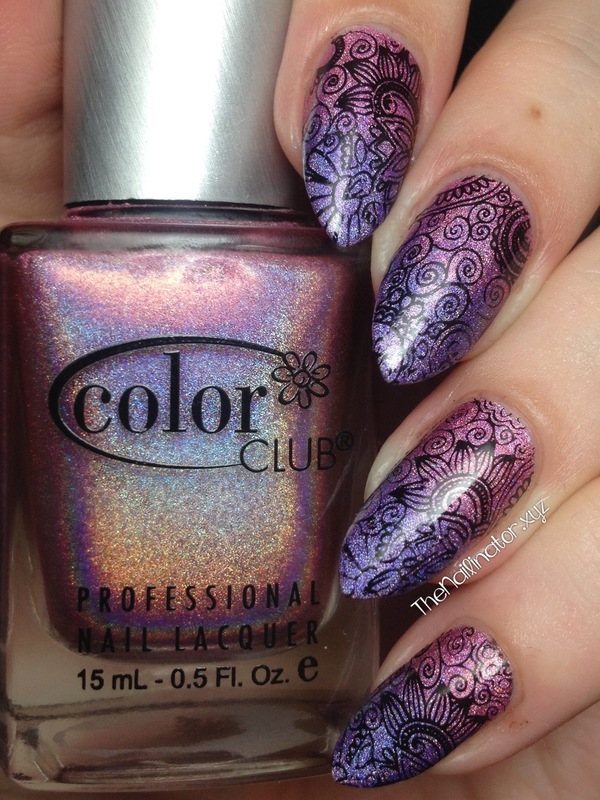 Today I’ve got a pretty gradient and stamped mani to share with you. I started off with one coat of Miss Bliss. Then I taped off my cuticle area to minimize the clean up and sponged Eternal Beauty on the tips of my nails. 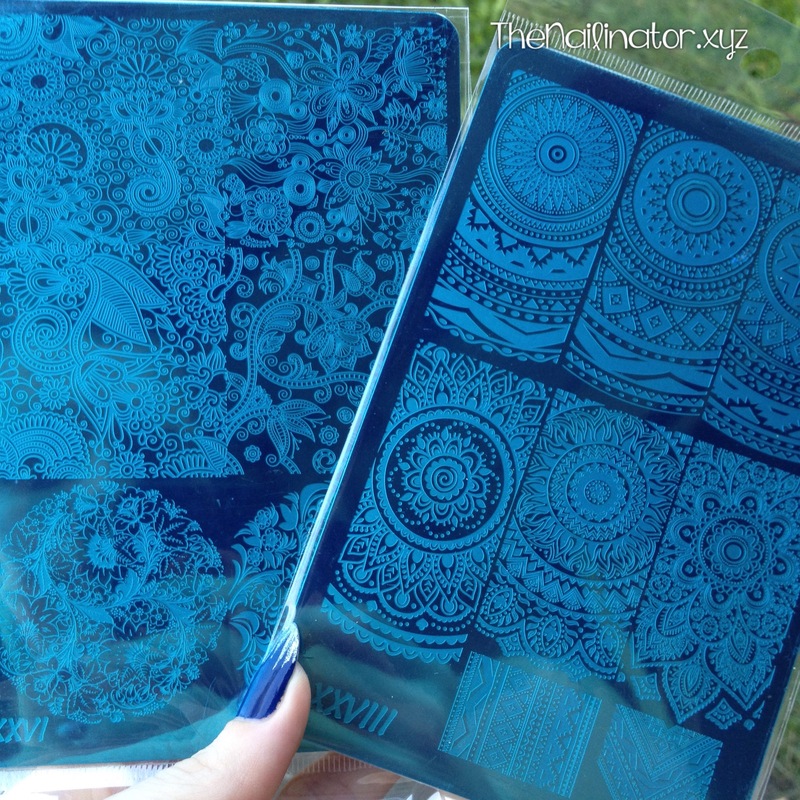 Then I used my fabulous MJ XXVI stamping plate from My Online Shop. This plate is my FAVORITE floral plate. I can’t get enough of it. Edited to add: I just noticed that My Online Shop is having a 10% off sale from November 24-30. Enter the code BLKFRIDAY2016 at checkout. Aren’t they magical? So girly and sparkly! I loved wearing these and I received lots of compliments on them. That’s always fun! Now for a mandatory macro shot…. Soooo pretty! This is one of my favorite designs I’ve worn so far this year. 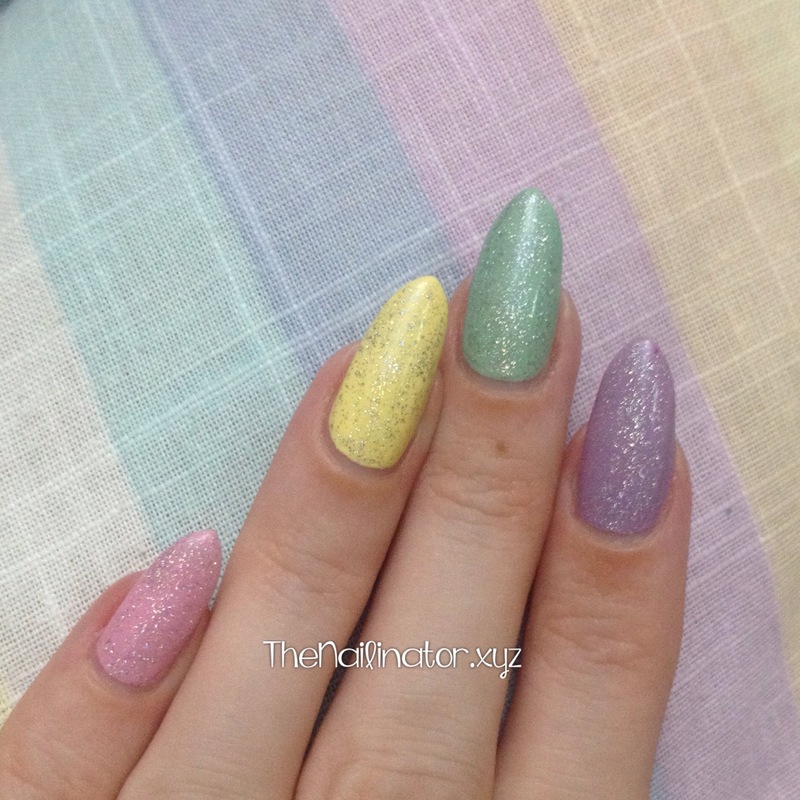 Gradient nails are so easy to do and the possibilities are endless. 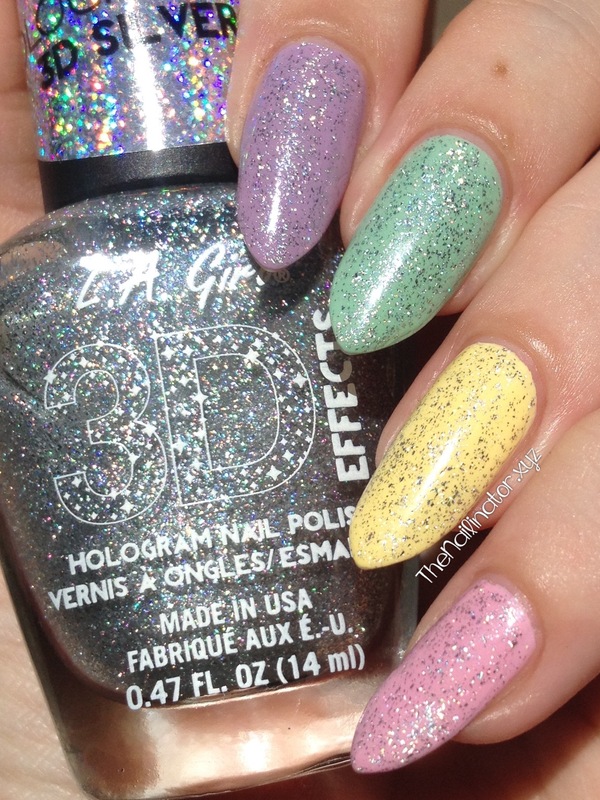 If you haven’t tried a gradient look, then grab a sponge and your favorite polishes and go ahead and give it a try! Maybe I should make a photo or video tutorial for you? I’ve been testing out a new product that I’m so excited to share with you. Keep an eye out for my next post! Have a fantastic day! I loved these and the fact that the colors fit together perfectly for a look that just screams romance and spring time! I added one coat of L.A. Girl 3D Silver because…well because WHY NOT? Amiright? I also want to show you the skittles that I did for the Shutterbug. 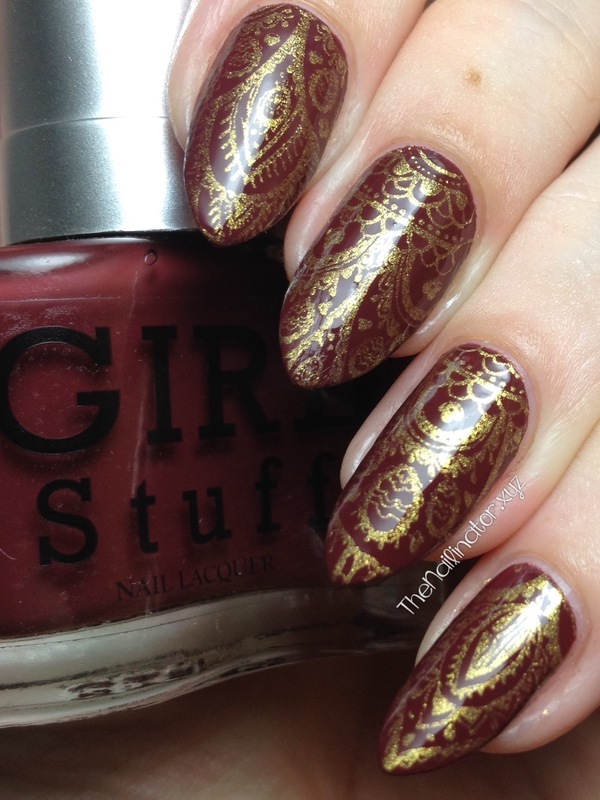 We added some gorgeous stamping using my awesome MJ XXVIII stamping plate from My Online Shop. 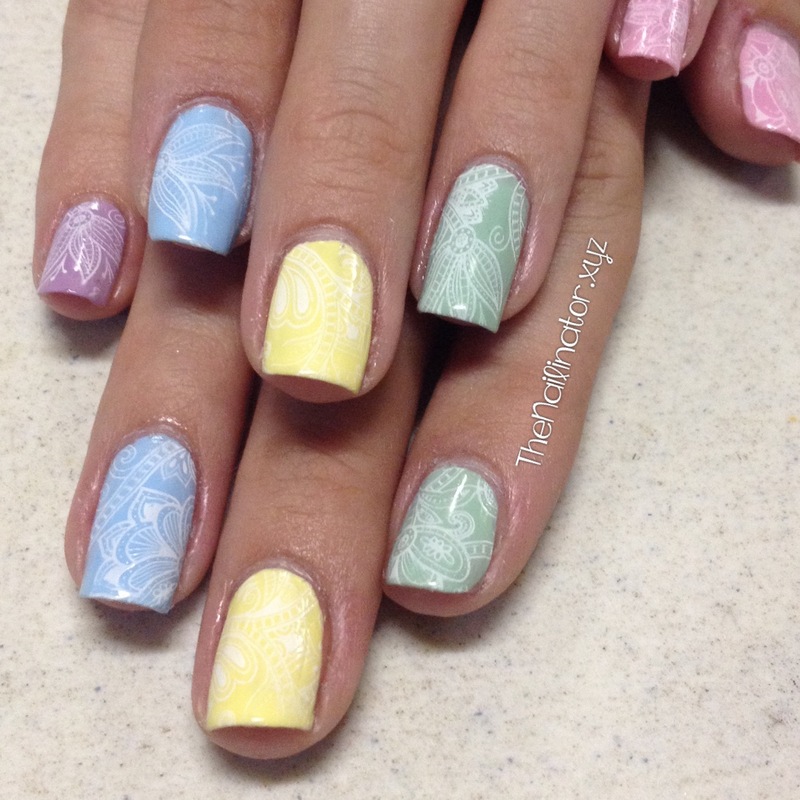 The stamping is in white, so it is subtle (especially over the yellow), but it is oh so pretty! What do you think about this collection? I usually shy away from yellows and greens, but I can pull off a pastel yellow and pastel green. I love these colors! 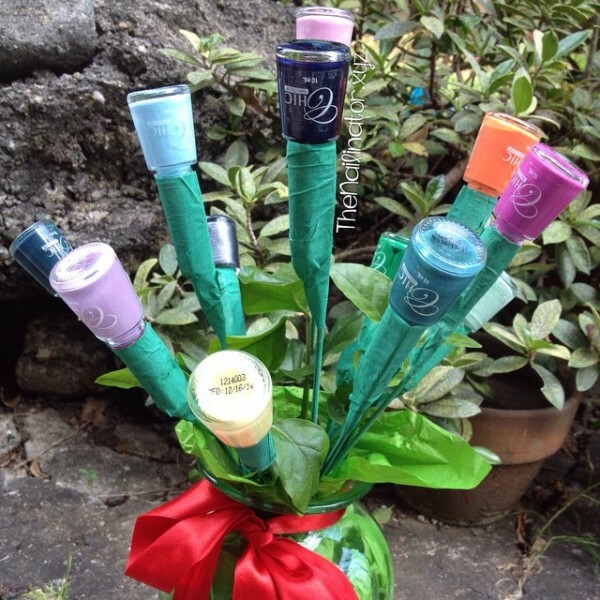 Oh and here’s a shot of the bouquet my husband made for me on Valentine’s Day. Have a great week! I hope that you get some coffee and some chocolate to help you cope with the fact that it is Monday. Ugh! Keep smiling anyway! I’ve got another quick post for you this evening to share these super cute nails I have been sporting for almost a week now. Don’t you think they look like Christmas wrapping paper? They turned out so cute and were very easy to do. I applied my gold polish then added stamping using a no name brand opaque green polish I have in my stash. 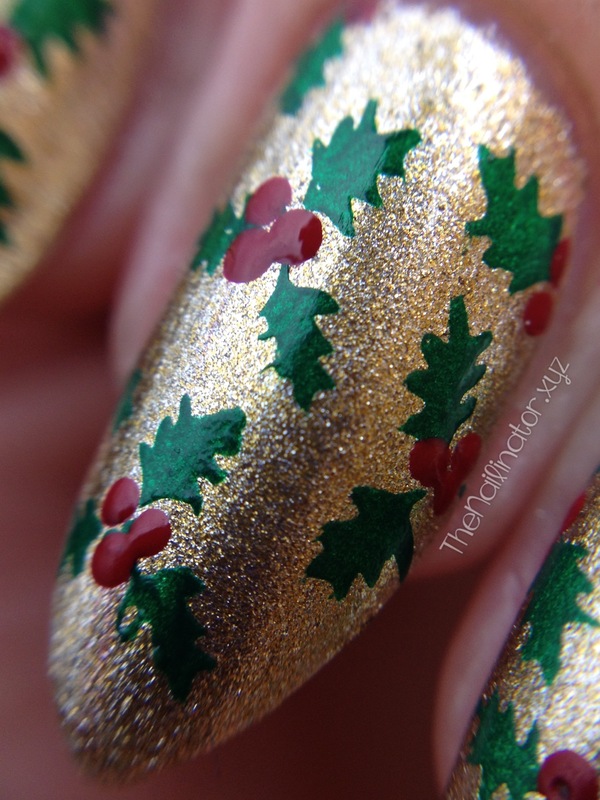 I used a small dotting tool to make the red holly berries. 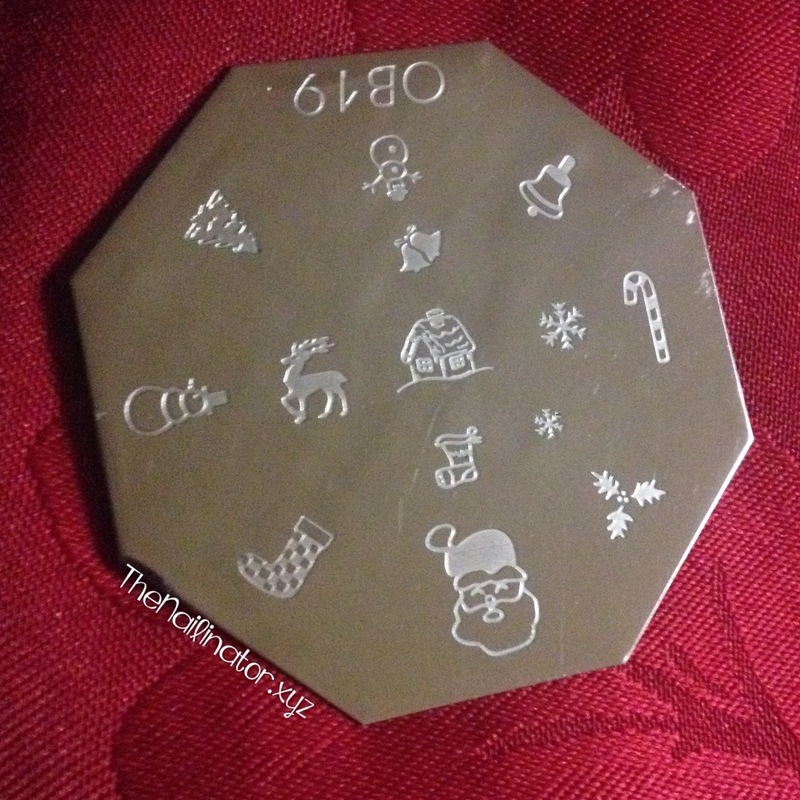 The holly image is part of the OB19 stamping plate which I purchased last year from Myonline Shop. This image is just perfect for Christmas nail art. It is loaded with great images. I used the two snow flake images for some nail art last December. 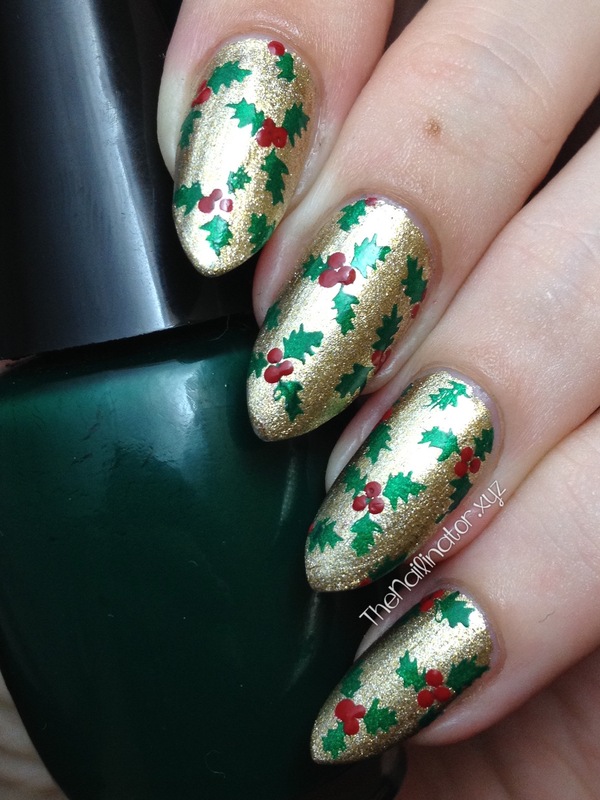 I also used the Christmas tree image for some simple nail art on The Bookworm last night. You can see those if you check out my Instagram account. As you can tell, I chose to stamp the holly image multiple times to cover each nail. 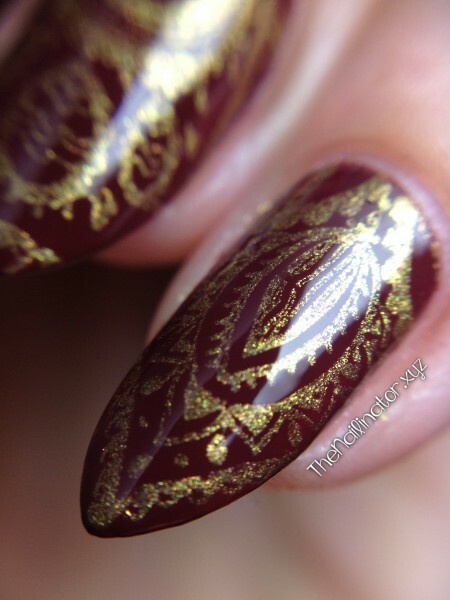 I did start off with this as a simple accent nail (see below). It was a couple of days and several compliments later that I decided I needed holly on all my nails. I finally got my hands on a clip-on macro lens for my phone. So I took a shot of these just for fun! Well, I hope you like these as much as I do and that they give you some inspiration for some fun holly-day nails.